Background The UK-based General Practice Research Database (GPRD) is a valuable source of longitudinal primary care records and is increasingly used for epidemiological research. Aim To conduct a systematic review of the literature on accuracy and completeness of diagnostic coding in the GPRD. Design of study Systematic review. Method Six electronic databases were searched using search terms relating to the GPRD, in association with terms synonymous with validity, accuracy, concordance, and recording. A positive predictive value was calculated for each diagnosis that considered a comparison with a gold standard. Studies were also considered that compared the GPRD with other databases and national statistics. Results A total of 49 papers are included in this review. Forty papers conducted validation of a clinical diagnosis in the GPRD. When assessed against a gold standard (validation using GP questionnaire, primary care medical records, or hospital correspondence), most of the diagnoses were accurately recorded in the patient electronic record. Acute conditions were not as well recorded, with positive predictive values lower than 50%. Twelve papers compared prevalence or consultation rates in the GPRD against other primary care databases or national statistics. Generally, there was good agreement between disease prevalence and consultation rates between the GPRD and other datasets; however, rates of diabetes and musculoskeletal conditions were underestimated in the GPRD. Conclusion Most of the diagnoses coded in the GPRD are well recorded. Researchers using the GPRD may want to consider how well the disease of interest is recorded before planning research, and consider how to optimise the identification of clinical events. Information collected routinely from primary care can provide a cost-effective source of data for epidemiological research.1 One of the main benefits of using automated databases for research lies in the ability to access data from large patient populations across a wide population coverage. While these datasets represent a valuable tool for conducting research, it is important to remember that the data are collected primarily for clinical and routine use rather than specifically for research purposes. Data quality and reliability must be considered by researchers using these resources. As the GPRD is increasingly used for academic research, it is important to consider the quality of the data available for study. The aims of this paper are to conduct a systematic review of the literature to present a description of the accuracy and completeness of recording in the GPRD. Specifically, the paper will consider both the recording of clinical diagnoses and comparisons between the GPRD and other databases or national statistics. Six electronic databases were searched (MEDLINE, Embase, British Nursing Index, PsycINFO, Health Management Information Consortium, Social Sciences Citation Index) from inception to May 2009, using search terms relating to the GPRD in association with terms synonymous with validity, accuracy, concordance, and recording. See Appendix 1 for an example of the MEDLINE search. Two reviewers screened the titles and abstracts of all papers in the initial search, and excluded citations that did not meet the inclusion criteria. Disagreements at this stage were resolved through discussion; however, the full-text paper was ordered when either reviewer was uncertain about inclusion. One reviewer independently assessed the retrieved full-text papers for relevance and inclusion, and hand searched the reference lists of all retrieved papers. The same reviewer also conducted a hand search of the GPRD bibliography provided on the GPRD website,7 and included any potentially relevant papers in the review process. The UK General Practice Research Database (GPRD) is increasingly used for academic primary care researchers. Data collected for automated databases such as the GPRD are subject to a number of quality checks, but the validity and accuracy of specific disease coding may vary. This paper describes a systematic review of studies that conducted validation of diagnoses in the GPRD or compared rates of disease in the GPRD against other databases. The majority of diagnoses were reliably coded; however, investigators conducting research using the GPRD should consider how information is captured in primary care and how the variation in recording practices for different diseases and prevalent conditions may affect research. Studies that specifically considered the accuracy of recording of data in the GPRD were included, and those that looked at the accuracy of recording of data as part of a larger study. Papers written in English and non-English languages were considered for inclusion. Papers that did not look specifically at the GPRD were excluded, as well as those that were not original research and papers that did not conduct validation or comparison of information held on the GPRD. Database comparison studies were also excluded if the study compared prevalence rates over different time periods. Two investigators independently reviewed articles meeting the inclusion criteria and abstracted relevant data onto a standardised data extraction form. A third reviewer resolved any uncertainties in relation to the main outcomes. This review considers both the accuracy and completeness of data recording in the GPRD. The accuracy of diagnoses was achieved by comparing the GPRD-coded data in the electronic patient record against the gold standard defined in each paper. Assessing the completeness of data was achieved by comparing disease prevalence and prescription rates between the GPRD and other national datasets and determining the level of under-reporting or over-reporting in the GPRD. Positive predictive value (PPV) was defined as the proportion of GPRD-coded diagnoses validated as true cases against a gold standard (GP questionnaire, primary care medical records, or hospital letters). Where the investigators used a GP questionnaire or request for hospital notes, the percentage validated was calculated using the returned questionnaires as the denominator. Stata (version 10.0) was used to calculate binomial exact 95% confidence intervals (95% CIs) for each PPV, and to produce a forest plot of PPVs for correct coding of clinical diagnoses. A pooled PPV was not calculated, due to the variability in the included studies. A total of 46 papers were identified through the literature search and included in this review. Three additional papers were identified through hand searching the reference lists of the final 46 papers.8–10 Therefore, a total of 49 papers entered the review (Figure 1). Results are presented in the following main groupings: (1) validation of clinical diagnoses and (2) comparisons between GPRD and other national statistics or databases. Flowchart of literature search results. A total of 40 papers conducted validation of a diagnosis or patient characteristic coded in the GPRD database. Most of these validation exercises involved sending a questionnaire to the patients' GPs (n = 19) and conducting independent verification of diagnoses against hospital letters or medical records in practice (n = 16). Some studies involved both sending a GP questionnaire and conducting verification against medical records (n = 5). The PPV of the accuracy of GPRD clinical codes from these validation exercises is summarised in Figure 2. The majority of papers report PPVs over 50%, and simply required patients' GPs to confirm the diagnosis on the GPRD database. Five of the seven papers reporting a PPV under 50% considered acute outcomes including drug-induced liver injury, pancreatitis, or renal failure.11–15 The studies considering acute conditions all used strict diagnostic criteria to validate cases, which included confirmation of the diagnosis via biochemical tests or specialist confirmation. 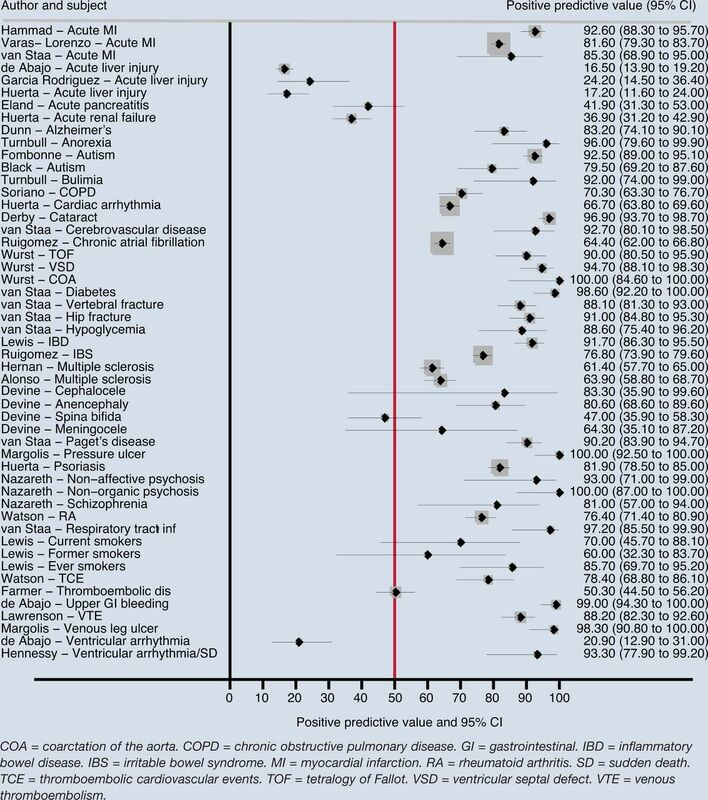 Forest plot reporting positive predictive values of diagnoses in the General Practice Research Database. Recording of psoriasis,26 venous thromboembolism,27 schizophrenia,23 dementia, and Alzheimer's disease28 was relatively accurate, with PPVs between 80% and 90%. Other diagnoses, including cardiovascular events and thromboembolic disease,10,29 irritable bowel syndrome,30 chronic obstructive pulmonary disease,31 chronic atrial fibrillation,32 and cardiac arrhythmia,33 were not as accurately recorded, with reported PPVs lower than 80%. Devine et al conducted a validation study using an algorithm to identify children with neural tube defects. They reported an overall PPV of 71% (95% CI = 63 to 78%); however, the PPV varied considerably according to the specific neural tube defect diagnosis.44 While anencephaly and cephalocele were generally well recorded, spina bifida was not. The Read Code algorithm used by the authors located spina bifida in the mother and not the child in 37% of cases. Three studies compared the GPRD with the Doctors' Independent Network (DIN), a UK-based primary care database that has been collecting routine data from over 300 practices distinct from the GPRD since 1989.51–53 Generally, there was good agreement between the two databases for common childhood conditions, hay fever, ischaemic heart disease, and prescribing for skin emollients. 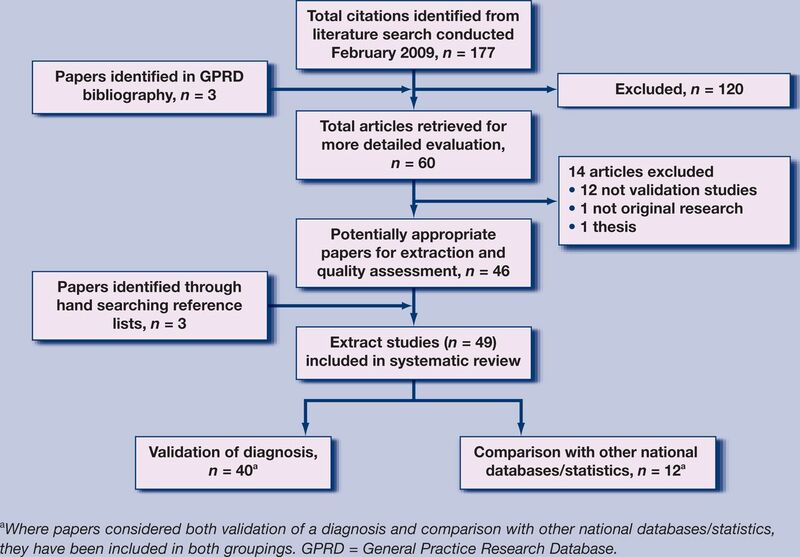 A systematic review of literature was carried out to validate the accuracy and completeness of the UK GPRD. The studies included in this review considered the accuracy of diagnostic codes in the GPRD and the completeness of data compared with other databases and national statistics. Most of the diagnoses coded in the GPRD electronic record were well recorded when compared against GP questionnaire responses, medical records held at the GP practice, or hospital letters. However, it seems that acute diagnoses were not as well recorded. The studies in this review used a variety of ‘gold standard’ references to ascertain the accuracy of diagnoses, which may explain some of the differences in accuracy of diagnosis recording, especially in the validation of acute conditions. When a questionnaire is sent to a GP to support the accuracy of a diagnosis, the GP has several options for verifying the diagnosis, including checking through the computerised medical record or free-text information, looking for supporting evidence for a diagnosis from test results or hospital discharge letters, or relying on memory alone. Investigators conducting independent validation of a diagnosis can also request copies of patient medical records, hospital discharge letters, or correspondence or biochemical test results. This extra information can be used to find key words relating to a diagnosis, or conduct expert validation of a diagnosis. Several studies assessed the accuracy of recording against an objective standard as defined by an external body; for instance, acute liver injury defined as an increase of more than two times the upper limit of normal in alanine aminotransferase by international consensus statement, or evidence of specific behavioural or cognitive symptoms as described in the Diagnostic and Statistical Manual of Mental Disorders.15,23,34 The number of patient records validated may depend on the level of evidence required to assess the accuracy of recording. Only three papers looked specifically at the differences between the date of onset of disease in the GPRD electronic medical record and the GP-reported date.19,28,35 Although there were some inconsistencies in date recording, the differences were small. Investigators who require precise dates of onset of disease may need to be aware that there could be a slight difference in the date recorded in the electronic record and, if necessary, conduct further validation. Generally, there is good agreement in disease prevalence rates between the GPRD and other national databases and statistics; however, there were some differences identified in this review. There is no ‘gold standard’ measure against which data from one database can be compared, or to suggest which database contains the most accurate measure. Discrepancies between two data sources do not necessarily mean that one database is right and one is wrong. There may be geographical differences or disease coding system variability that will lead to systematic differences in disease prevalence or data recording.48 It is important to consider these differences when conducting research using these datasets. This is the first study to search for studies systematically and to combine studies that consider the accuracy and completeness of the GPRD. By using broad search terms it was possible to find a wide range of literature covering a range of diagnoses. This review provides vital information to aid researchers and clinicians who are planning to conduct research using the GPRD. However, very few of the papers in this review gave results that were directly comparable. A wide range of diagnoses were considered and many of the investigators used different criteria to assess the validity of diagnoses, making it difficult to compare directly PPVs across studies even when diagnoses were the same. There was often a lack of an objective standard for comparison of data recording, and the papers in this review often used a variety of methods to judge the accuracy of clinical diagnoses in the patient electronic records. Finally, many of the studies included in this review only validated a small number of patient records, due to the expense of conducting validation of diagnoses via GP questionnaire or independent evaluation of hospital letters or medical records. Several UK-based studies consider the quality of morbidity coding in general practice, and a systematic review of these studies shows that morbidity coding in general practice is variable. However, the investigators suggest that conditions with clear diagnostic features are better recorded than conditions with more subjective criteria.58 In their paper, Jordan et al include eight GPRD studies which are also assessed in the current review. The sensitive search strategy used in this study, which specifically considered the GPRD, made it possible to find and consolidate information from a larger number of papers validating a diagnosis in the GPRD. Thiru et al investigated the quality of data in primary care; however, their review focused more on how well GPs record the outcome of a consultation on electronic patient records.59 Their review also found that studies report consistently high PPVs, indicating that data on the patient record were valid. As noted in the present review, the authors point out that variability in the assessment of data quality made it difficult to compare results directly between studies. Investigators conducting research using the GPRD need to consider carefully how information is recorded in primary care, and how GPs may use different Read/OXMIS codes to represent the same diagnosis. Some diagnoses may be recorded differently from others. This review suggests that researchers can be confident about case validity when using the GPRD for research into most chronic conditions. However, research into acute conditions may need additional validation. It may not be feasible to conduct validation studies of diagnoses in the GPRD for every project, as this can be expensive; current prices start at £60 per patient for a questionnaire or request for additional information from a practice. One approach to ensure better identification of cases is to construct Read/OXMIS code diagnostic algorithms comprising several codes to identify events and diagnoses in the GPRD. Often, these diagnoses can then be internally validated using evidence within the GPRD to support the diagnosis; for instance, a Read/OXMIS code for an acute myocardial infarction may be followed by a referral to cardiology, details of a discharge letter from hospital, and relevant medication. A study validating the recording of neural tube defects found that in some cases, the diagnosis represented a condition in the mother and not in the child. Birth defect researchers using the GPRD may wish to search the mother's medical history to determine whether the code relates to a diagnosis in the mother or the child. This supplemental information can be obtained from within the GPRD to improve the reliability of diagnostic codes. Prescription data are well recorded in the GPRD because prescriptions for patients are generated directly from the computer, and details on drug type and dosage are digitally recorded in this automated process. Therefore, prescribing data can be used to verify clinical diagnoses, or to capture additional cases. For instance, use of inhalers was used as a proxy for asthma diagnoses.48 However, investigators should be cautious about using drug prescribing as a proxy for disease, and ensure that the prescribed drug is specific to the diagnosis of interest. One of the future strengths of the GPRD lies in planned linkages with other national databases, including the Hospital Episodes Statistics, and Office for National Statistics databases, and the National Cancer Intelligence Network. These linkages will allow investigators to access more detailed clinical information relating to inpatient and outpatient hospital attendances and diagnoses, death registration, cause of death, and cancer diagnoses and treatment. This additional information will be a source of accurate and complete information on many of the clinical outcomes occurring outside of primary care. Appendix 1. Sample search strategy used in MEDLINE. Nada Khan has undertaken this work as part of a research training fellowship funded in the UK by Macmillan Cancer Support. This work was also supported by Cancer Research UK (CR-UK) grant number C23140/A8854. Revision received June 11, 2009. (2006) The use of general practice consultation databases in rheumatology research. Rheumatology (Oxford) 45(2):126–128. (1997) The UK General Practice Research Database. Lancet 350(9084):1097–1099. (1998) Use of the UK General Practice Research Database for pharmacoepidemiology. Br J Clin Pharmacol 45(5):419–425. (2007) Data quality assessment in GPRD (Crown Copyright, London). (1980) Registry evaluation methods: a review and case study. Epidemiol Rev 2:210–220. Bibliography (GPRD, London) http://www.gprd.com/bibliography/ (accessed 20 Jan 2010). (2002) Relation of childhood gastrointestinal disorders to autism: nested case-control study using data from the UK General Practice Research Database. BMJ 325(7361):419–421. (1994) The quality of information recorded on a UK database of primary care records: a study of hospitalizations due to hypogylcemia and other conditions. Pharmacoepidemiol Drug Saf 3:15–21. (2002) Lower risk of thromboembolic cardiovascular events with naproxen among patients with rheumatoid arthritis. Arch Intern Med 162(10):1105–1110. (2004) Acute and clinically relevant drug-induced liver injury: a population based case-control study. Br J Clin Pharmacol 58(1):71–80. (2000) The risk of acute pancreatitis associated with acid-suppressing drugs. Br J Clin Pharmacol 49(5):473–478. (1999) A cohort study on the risk of acute liver injury among users of ketoconazole and other antifungal drugs. Br J Clin Pharmacol 48(6):847–852. (2002) Risk of acute liver injury in patients with diabetes. Pharmacotherapy 22(9):1091–1096. (2005) Nonsteroidal anti-inflammatory drugs and risk of ARF in the general population. Am J Kidney Dis 45(3):531–539. (1996) The demand for eating disorder care. An epidemiological study using the general practice research database. Br J Psychiatry 169(6):705–712. (2000) Risk of cataract among users of intranasal corticosteroids. J Allergy Clin Immunol 105(5):912–916. (2007) The utility of the general practice research database to examine selected congenital heart defects: a validation study. Pharmacoepidemiol Drug Saf 16(8):867–877. (2002) Incidence and natural history of Paget's disease of bone in England and Wales. J Bone Miner Res 17(3):465–471. (2000) The use of a large pharmacoepidemiological database to study exposure to oral corticosteroids and risk of fractures: validation of study population and results. Pharmacoepidemiol Drug Saf 9(5):2000. (1999) Association between selective serotonin reuptake inhibitors and upper gastrointestinal bleeding: population based case-control study. BMJ 319(7217):1106–109. (1993) Accuracy of diagnosis of psychosis on general practice computer system. BMJ 307(6895):32–34. (2002) Venous leg ulcer: incidence and prevalence in the elderly. J Am Acad Dermatol 46(3):381–386. (2002) The incidence and prevalence of pressure ulcers among elderly patients in general medical practice. Ann Epidemiol 12(5):321–325. (2007) Incidence and risk factors for psoriasis in the general population. Arch Dermatol 143(12):1559–1565. (2000) Validation of the diagnosis of venous thromboembolism in general practice database studies. Br J Clin Pharmacol 49(6):591–596. (2005) Association between dementia and infectious disease: evidence from a case-control study. Alzheimer Dis Assoc Disord 19(2):91–94. (1999) Oral contraceptives and venous thromboembolic disease. Analyses of the UK General Practice Research Database and the UK Mediplus database. Hum Reprod Update 5(6):688–706. (2003) Is hormone replacement therapy associated with an increased risk of irritable bowel syndrome? Maturitas 44(2):133–140. (2001) Validation of general practitioner-diagnosed COPD in the UK General Practice Research Database. Eur J Epidemiol 17(12):1075–1080. (2002) Incidence of chronic atrial fibrillation in general practice and its treatment pattern. J Clin Epidemiol 55(4):358–363. (2005) Respiratory medications and the risk of cardiac arrhythmias. Epidemiology 16(3):360–366. (2004) Validation of the diagnosis of autism in general practitioner records. BMC Public Health 4:5. (2008) Determining the predictive value of Read/OXMIS codes to identify incident acute myocardial infarction in the General Practice Research Database. Pharmacoepidemiol Drug Saf 17(12):1197–1201. (2000) Hormone replacement therapy and incidence of acute myocardial infarction. A population-based nested case-control study. Circulation 101(22):2572–2578. (2005) Recent use of oral contraceptives and the risk of multiple sclerosis. Arch Neurol 62(9):1362–1365. (2004) Recombinant hepatitis B vaccine and the risk of multiple sclerosis: A prospective study. Neurology 63(5):14. (1999) Risk of ventricular arrhythmias associated with nonsedating antihistamine drugs. Br J Clin Pharmacol 47(3):307–313. (2008) Diagnostic codes for sudden cardiac death and ventricular arrhythmia functioned poorly to identify outpatient events in EPIC's General Practice Research Database. Pharmacoepidemiol Drug Saf 17(12):1131–1136. (1991) Validation of information recorded on general practitioner based computerised data resource in the United Kingdom. BMJ 302(6779):766–768. (1992) Further validation of information recorded on a general practitioner based computerized data resource in the United Kingdom. Pharmacoepidemiol Drug Saf 1:347–349. (2008) Validation of neural tube defects in the full featured — general practice research database. Pharmacoepidemiol Drug Saf 17(5):434–444. (2004) Agreement between GPRD smoking data: a survey of general practitioners and a population-based survey. Pharmacoepidemiol Drug Saf 13(7):437–441. (1998) Appendectomy protects against ulcerative colitis. Epidemiology 9(2):205–207. (1992) Antidepressant drugs and suicide. J Clin Psychopharmacol 12(4):235–240. (1999) Use of the General Practice Research Database (GPRD) for respiratory epidemiology: a comparison with the 4th Morbidity Survey in General Practice (MSGP4) Thorax 54(5):413–419. (1997) The General Practice Research Database: quality of morbidity data. Popul Trends (87):36–40. (2007) Measuring disease prevalence: a comparison of musculoskeletal disease using four general practice consultation databases. Br J Gen Pract 57(534):7–14. (2003) Implications of the problem orientated medical record (POMR) for research using electronic GP databases: a comparison of the Doctors Independent Network Database (DIN) and the General Practice Research Database (GPRD) BMC Fam Pract 4:14. (2004) Developing a large electronic primary care database (Doctors' Independent Network) for research. Int J Med Inform 73(5):443–453. (2004) A comparison of the recording of 30 common childhood conditions in the Doctor's Independent Network and General Practice Research Databases. Health Stat Q (22):21–31. (2009) Investigation of the temporal association of Guillain-Barre syndrome with influenza vaccine and influenzalike illness using the United Kingdom General Practice Research Database. Am J Epidemiol 169(3):382–388. (2000) A comparison of trends in problematic drug misuse from two reporting systems. J Public Health Med 22(3):362–367. (2007) Evaluation of the General Practice Research Database congenital heart defects prevalence: comparison to United Kingdom national systems. Birth Defects Res A Clin Mol Teratol 79(4):309–316. (2004) Quality of morbidity coding in general practice computerized medical records: a systematic review. Fam Pract 21(4):396–412. (2003) Systematic review of scope and quality of electronic patient record data in primary care. BMJ 326(7398):1070.